God of might, giver of every good gift, put into our hearts the love of your name, so that, by deepening our sense of reverence, you may nurture in us what is good and, by your watchful care, keep safe what you have nurtured. Through our Lord Jesus Christ, your Son, who lives and reigns with you in the unity of the Holy Spirit, one God, for ever and ever. And he called the people to him again, and said to them, "Hear me, all of you, and understand: there is nothing outside a man which by going into him can defile him; but the things which come out of a man are what defile him." For from within, out of the heart of man, come evil thoughts, fornication, theft, murder, adultery, coveting, wickedness, deceit, licentiousness, envy, slander, pride, foolishness. All these evil things come from within, and they defile a man (Mark 7:14-15, 21-23)." The first reading is taken from the Book of Deuteronomy 4:1-2, 6-8 in which the chosen people are urged to carry out the laws God gave them. If they do, they will give good example to the pagan peoples among whom they live, and will make these pagans see how good God is to His chosen people. The second reading is from the Letter of James 1:17-18, 21-22, 27. St. James exhorts us to be Christians in practice, not in theory; to "do", to live according to the law laid down for us. The Gospel is from St. Mark 7:1-8, 14-15, 21-23. When Christ came on earth the Scribes and Pharisees were the religious leaders of the Jews. The Scribes, so called because of their knowledge of the Mosaic Law and the traditions added on to it, were the elite among the Pharisees who prided themselves on their strict, rigorous observance of the Law and the human traditions. The Pharisees had no time or no understanding for their fellow-Jews who often violated the scribal traditions — and even the Law of Moses itself sometimes. For this reason they kept themselves apart from the ordinary people and developed a proud superiority complex. They performed many acts of virtue but their pride and sense of self-sufficiency vitiated their good deeds (see the description of the Pharisee and the tax-gatherer in the temple, in Lk. 18: 10-14). The opposition of the Pharisees and Scribes to Jesus began very early in his public life. It grew in strength daily until, with the help of the Sadducees, their arch-opponents, they finally nailed him to the cross. The main reason why they opposed him so bitterly was his mercy, kindness and understanding for sinners. He ate with tax-gatherers and made one of them, Levi, an Apostle. He forgave the adultress and many, many others. While he certainly did not approve of sin, he never uttered a hard word against any sinner. He had come, as he said, to call sinners to himself and to repentance. This he did all through his public life. He objected to the Pharisees, not because of their strict observance of the Mosaic Law nor of their insistence on human traditions — although they sometimes carried this to an intolerable extreme. He objected because they despised the lowly people, the uneducated in the law and traditions — those, in other words, who did not belong to their own exclusive class. To the Pharisees all these were "sinners," while they themselves had the worst sin of all — the original sin of mankind, the sin of pride. In today's encounter with the Pharisees, Jesus tells them that they are hypocrites: "they honor God with their lips but their heart is far from God"; they obey the Law and the traditions, not to please God, but to be seen and admired by men; their motive, self-glorification, vitiates every otherwise good act they perform. 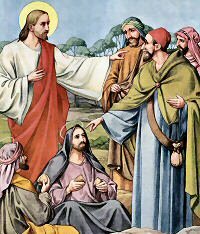 Christ then addresses the people — the crowds who most likely had overheard his dialog with the Pharisees — and he tells them that it is not legal or cultic uncleanliness that matters, but cleanliness of the heart before God. Eating with unwashed hands, or using unwashed vessels for drinking, does not defile a man, this does not make him less worthy before God. It is not from things outside him that a man incurs defilement but from his own innermost self. Every serious sin against God and neighbor has its beginning within a man, in his intellect and will; the evil design is the forerunner and instigator of the evil deed. The Pharisees should have known all this. They did know it. They knew very well that before a man breaks any of the commandments of God he must first plan and decide to break it; it was not their theology that was defective but their practice. They despised their neighbors and called fellowmen "sinners," because through ignorance they violated many of the man-made precepts the Pharisees had added to the Law of Moses. There were also fellow-Jews of theirs who violated the law itself, but it was not their right to judge or condemn much less excommunicate them, as they so often did in practice.